Media interest during the listing period and our heightened profile had a marked effect on staff morale. Pride in Bidvest complemented pride in individual operations. Our staff is self-reliant and resourceful, serving a huge country with a thinly scattered population of only two million. We derive great satisfaction from our status as reliable suppliers that get the job done with complete professionalism. We are working to raise the level of strategic thinking, challenging managers across the business to consider sustainable development as an opportunity rather than a cost. The company is an empowerment leader with broadening local participation in business operations. Economic performance – We concluded the Ovanhu transaction, effective June 30 2009, securing local ownership for 14,8% of the shares in Bidvest Namibia. Three shareholder groups (lead partner, Union Investment Company and Women for Action and Development) and various community groups participated in the transaction. By reopening our pilchard cannery, over 800 people have again found seasonal employment. Namsov owns 50,1% of Trachurus Fishing, a joint venture with four smaller local fishing companies. Under Namsov management, the company continues to perform well in the harvesting of its horse mackerel quotas. Environment – Fish stocks continue to be responsibly managed by the authorities through fishing quotas. Following the recovery of both horse mackerel and pilchard populations, quotas are steadily increasing. Collateral damage to the marine environment is limited by targeted midwater trawling, gear losses are minimal and our by-catch remains low at 1% of total catches. We are converting our fleet to run on cheaper fuel grades. We continue to improve the efficiency of freight operations. Manica handles sulphur and zinc, potentially hazardous to the environment. The company is ISO 9001 compliant. No spills were reported and no fines levied for non-compliance with local or international environmental regulations. Human resources – Staff numbers have increased by 29%, mostly in our fishing operations. Crews have representation through unions and the company enjoys generally good industrial relations. We enrolled our first two Namibian officer candidates at the officers’ training school in Saldanha, South Africa, the start of a 13- to 15-year programme. Transferring skills into the local economy is a challenge given difficulties in renewing working visas for foreigners. Health and safety – Government observers monitor operations at sea, during transhipments and discharges. Namsov adheres to all international maritime regulations, with special emphasis on safety. No serious incidents were recorded. HIV/Aids and health-related absenteeism are major concerns, particularly in fishing, transport and stevedoring operations. However, we recorded fewer cases, as well as significantly lower absenteeism. We continue our support in the form of VCT and the use of ARVs. No work-related fatalities were recorded. 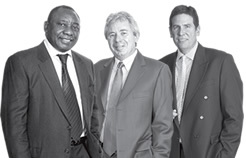 Labour disputes – Five arbitration cases were brought against Bidvest Namibia, with four findings against the division. Society – More rigorous local reporting requirements following our listing helped drive more formal governance processes. New structures include separate risk, audit and sustainability committees, dealing with the risks of fraud, corruption and anticompetitive behaviour. Corporate social investment – The Namsov Community Trust, a 10% shareholder in Namsov, invested R3,2 million in projects to help people and communities in need. The trust supplied training equipment to a training facility in the remote town of Keetmanshoop (NAD1,0 million), established an endowment fund for the University of Namibia to assist postgraduate students doing research on coastal and marine subjects in the coastal town of Henties Bay (NAD1,0 million) and continues to sponsor preparatory schools in disadvantaged areas during school holidays for Grade 10 learners. Further expansion is planned. Our businesses are strongly placed in their respective industries, creating a platform for continued organic growth. Acquisitive growth will not be neglected. We have a strong financial position and substantial cash resources. More than NAD300 million was raised by our listing. Significant growth has already been achieved by Namsov. Other areas of possible expansion are receiving attention. For example, Namibia’s tourism industry offers potential as do various service sectors. The business and the flagship Namsov brand performed strongly, driven by good catches and improved fish prices. We enhanced our reputation for quality and maintained our preferred supplier status in an increasingly competitive sector. Lower fuel prices were helpful. Horse mackerel operations exceeded targets. The inshore pelagic industry showed signs of recovery and achieved better-than-expected results. Internationally, the underperformance of other pelagic supplier zones supported demand for our product – further confirmation of the continuing need for responsible resource management. Acquisition of MFV Jupiter will result in improved fishing days at lower fuel costs. We secured an additional pilchard quota, leading to improved canning factory efficiencies. Several initiatives are planned to support future growth. Efforts will be made to secure additional quotas. Ways of optimising our canning capacity are under investigation, as is the development of fishing harbour infrastructure at our facilities in Walvis Bay. Exposure of our oyster business in the Walvis Bay lagoon to algae blooms will receive focused attention. Returns from our investment in an Angolan inshore fishing business are anticipated in the coming year. The business is made up of four components, Freight, Industrial and Commercial Products, Services and Foodservice. Performance was mixed as trading conditions deteriorated. Freight (Manica Group Namibia) performed well on the back of high demand for ships agency, clearing and forwarding and logistic services in Walvis Bay. Within Industrial and Commercial Products, Waltons, Kolok, CN Business Furniture and Voltex saw demand and volumes drop. The office furniture category was a casualty of corporate cutbacks while lower tender activity impacted Voltex. The strong Namibian dollar was negative for Kolok. Currency factors also put a brake on indirect Angolan demand across trading and retailing businesses. At Services, Rennies Travel cut costs and sought efficiencies to achieve pleasing results in the face of growing pressure. Minolco benefited from higher machine sales and good copy-click revenues. Budget Rent a Car was under pressure. A new Budget Rent a Car facility at Hosea Kutako International Airport is planned. Caterplus achieved sales growth despite capacity constraints. Plans to build a new facility in Windhoek are being finalised.